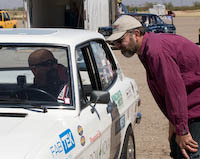 These are our favorite pictures from Bookman's Spring Thaw EV Drag Race on April 15, 2012, in Tucson, Arizona. Electric Miata vs. E-Fluxed electric DeLorean. DC Plasma vs. White Zombie. Lotus heritage race: E-Fluxed electric DeLorean vs. Tesla Roadster. Muscle car vs. White Zombie. White Zombie ready to go on the first run of the day, and Bob Oldfather's first run ever in White Zombie. White Zombie screaming down the track. Marissa taking care of John's sunblock. Bob Oldfather and Marko Mongillo having a little pre-race conference.